In this, the first volume of a planned series of works on Mormon thought, Blake T. Ostler explores Christian and Mormon notions about God. Written for both Mormons and non-Mormons interested in the relationship between Mormonism and classical theism, his path-breaking Exploring Mormon Thought: The Attributes of God is a critique of classical theism regarding some of the central concepts that have formed the Christian understanding of God. He deals with questions of traditional philosophical theology including free will and foreknowledge, the nature of God and Christology. The approach to these questions is from the analytic philosophical tradition and includes detailed arguments relating to the coherence of Christian belief, scripture and practice. However he recognizes that religious faith is far more a product of intimacy with the divine than of ultimacy of reason, more a product of relationships than of logical necessities. He provides an overview of the most influential Christian notions of deity, exploring themes and resources within this discourse that might be helpful to Latter-day Saint explorations. Also highlighted are various perspectives within Mormonism itself including a detailed analysis of Joseph Smith’s Lectures on Faith and discussion of the thought of Orson and Parley Pratt, B. H. Roberts and John Widstoe. Earlier Mormon thought is demonstrated to have included a concept of God as a being in process. He suggests areas in which Mormon approaches to questions about free agency and God’s omnipotence might suggest resolutions to some of the difficult issues that have troubled theologians and philosophers for centuries. For the first ever Ostler formulates a systematic Mormon Christology. In volume 2 of the series, Exploring Mormon Thought: The Problems of Theism and the Love of God, Blake Ostler explores issues related to soteriology, or the theory of salvation. He argues that the commitment that God loves us and respects our dignity as persons entails that God must leave us free to choose whether to have a saving relationship with him. He explores the "logic of love" and argues that the LDS doctrine of a "war in heaven" embodies the commitment that God leaves us free to choose whether to enter into relationship with God. He explores the nature of inter-personal prayer and the contributions of LDS beliefs to a robust prayer dialogue. He offers a view consistent with LDS commitments that makes sense out of asking God to assist others, to alter the natural environment and to grow in relationship with God. Finally, Ostler argues that creation out of nothing is not consistent with the type of freedom of will that is necessary to sustain loving relationships of the kind revealed in scripture. He argues that only the LDS view of uncreated intelligences allows for the kind of free will that is essential to leaving the beloved free as to whether to enter the divine relationship as a matter of grace. Blake Ostler announces his purpose as "a rescue operation to save the heart of God's revelations to the Hebrews from the Greek mind." The direct and powerful experience of the mysterious God that characterizes Hebrew religion was, he asserts, taken captive by the Greek fascination with intellectual puzzles. And the result was the complicated and unsatisfactory doctrine of the Trinity that has dominated traditional thinking ever since. Ostler steps through the common complaint that Mormons aren't Christian because they believe, not only in three separate individuals in the Godhead, but also in the deification of human beings. He demonstrates the clear biblical understanding, both in the precursors of the Old Testament and the New, that Jesus and God the Father were not one in some incomprehensible "substance" while separate in person, but were actually distinct individuals. What made them one was their indwelling love. It is that loving unity into which they invite human beings. A major contribution of this volume, the third in Ostler's series Exploring Mormon Thought, is his reconstruction of the Hebrew view of a council of gods, presided over by the Most High God. In the oldest Hebrew sources, Yahweh was one of these gods. Thus, from the beginning of the Christian revelation, there was no confusion about a shared identity, although Ostler's discussion of the king/vizier relationship in the honor and shame culture of the ancient world explains how the confusion could have arisen. In language and thought accessible to the lay reader but simultaneously rigorous and scholarly, Ostler analyzes and responds to the arguments of contemporary international theologians, reconstructs and interprets Joseph Smith's important King Follett Discourse and Sermon in the Grove just before the Mormon prophet's death, and argues persuasively for the Mormon doctrine of "robust deification." 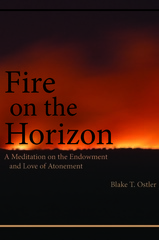 In this short volume, Blake Ostler departs from the more analytically rigorous approach that defined his groundbreaking Exploring Mormon Thought series and instead offers a meditation and reflection on the deeper and more important aspects of Mormon theology.